1/24th (County of London) Bn, The London Regiment, 142nd Brigade, 47th Division, T.F., B.E.F. Eric Dent was born in Malvern and attended Malvern Link Council School and Worcester Royal Grammar School (1911-1912). He joined the Royal Army Medical Corps Territorials in the first few months of the war at the age of 17, but transferred to the London Regiment before he went overseas. In November 1916 the Malvern News reported that he had been wounded in the foot. 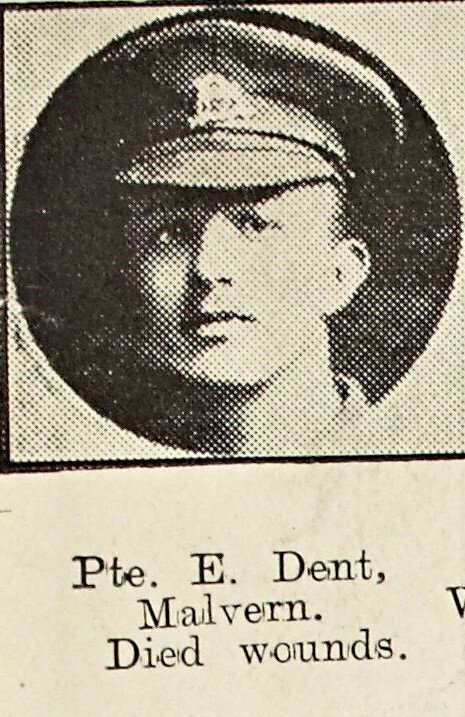 Then in June 1917 the family received official intimation that their son Pte E Dent had died of wounds. Reference was made to him at the Malvern Link Free Church: The Minister noted that he joined up at 17½ and that he fell at Messines – one of the first to go over the top after the explosion.